The Children’s Board building is a two-story, 30,000 square foot building on a 3.3 acre campus. It was designed by RBK Architects, Inc. and built by Mathews Construction, Inc. in 2004 for $4.2 million. 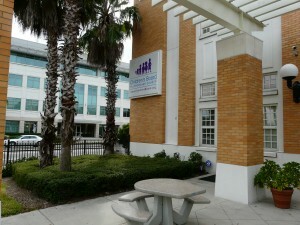 In addition the Children’s Board administrative offices, the building houses the Central Tampa Children’s Board Family Resource Center and also serves as a conference center available at no cost to neighborhood, community, and civic organizations. With free parking, easy access to public transportation, and a central location close to major transportation routes, our building is a convenient conference space for various community groups. We are proud to serve approximately 38,000 visitors annually. If you would like information about using our conference center, please complete the Conference Center Terms and Conditions 6.1.17 and Conference Center External Reservation Form 6.1.17 and email to reservations@childrensboard.org or fax to (813) 228-8122, Attn: CBHC Conference Center.